The ultimate in Quality, Style, and Function. 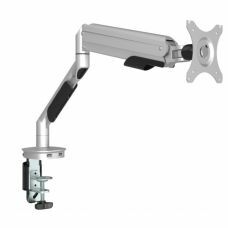 These Gas monitor arms combine seamless fluid movement in use with a modern ergonomic aluminium design, clip on cable management tidies any loose cables allowing a clean uncluttered desktop. Uniquely, both single and double gas monitor arms have 2 x 1.5m USB3 input/output cables in the base which can be plugged into the PC to download or charge from, they're positioned when installing the arms, so can be left out if not needed. Despite the modern compact design, the gas monitor arms could be considered heavy-duty products, with a 30" screen size, 9kg (19.8lb) capacity it's far more than is generally needed for standard office use. Each product comes with both through desk and clamp fixing, and every movement is adjustable to make it looser or stiffer to the user's comfort.